Join us for a German Movie Night at the University of Haifa. We will watch the movie "Emil und die Detektive" in German with English subtitles. Contemporary Societies all over the world are currently witnessing the reemergence of religious actors, claims and slogans into the political and social sphere. Together with Prof. Regina Pollack from the University of Vienna and Prof. Daniel Statman, the HCGES is organizing a two days international conference discussing the rise of religion and religious self-identification in contemporary societies. The international conference „The Bicentennial of Marx’s Birth” which took place on the 23rd and 24th of May at the University of Haifa was organized by the Haifa Center for German and European Studies (HCGES) conceptualized by Dr. Uri Zilbersheid and supported by the rector’s fund of the University of Haifa. On the 200 birth anniversary of Karl Marx, conferences took place worldwide to discuss about Marxism as a theory, but also about the consequences, problems and challenges for our todays late capitalist society. From May 9-10, 2018, a conference on the term and issues of „Parallel Societies“, hosted by Prof. Stefan Ihrig from the HCGES and Prof. Ton Nijhuis from the Duitsland Instituut Amsterdam, took place at the Safdie Auditorium at the University of Haifa. The conference included lectures by well-established Israeli and European social scientists as well as by DAAD Young Researchers from Europe and the United States. In addition to this, DAAD Young Researchers from all over the world had the opportunity to participate in the conference by introducing their research issues in form of posters and to discuss and get into contact with Israeli and European professors and lecturers. On the occasion of the 50th anniversary of the beginning of the first Frankfurt Auschwitz trial, the Hessian State Archive 2013 had prepared an exhibition on the NS trials in Hesse. On the basis of original documents, photographs and texts, this historical exhibition describes the legal treatment of Nazi crimes in the state of Hesse during the post-war period. The state of Hesse can be regarded as an example for the Federal Republic of Germany between 1945 and 1970: How did the state and society in the liberal-democratic part of Germany during the post-war period proceed in the legal investigation of the national socialist crimes of violence. The exhibition will now be presented in Israel with the support of the Hessian Ministry of Justice in a revised and translated Hebrew version. Movie Screeing of "Watani - My Homeland"
As part of "The Global Refugee Crisis: What is at Stake?" seminar there will be a movie screening of "Watani - My Homeland". You can find more information here. 2 credits (6 meetings of 4 hours each) - Dates: June 02/06, 07/06, 09/6, 14/6, 16/6, 21/6. The world is facing a dangerous power vacuum which may last for longer. This vacuum is developing because Europe and the USA are currently in a phase of relative decline, challenged by populism and isolationists policies, while China, India and Brazil are claiming international standing without being able to fill this role. A close look reveals several significant changes in global politics and the world economy: China, Russia, India and Brazil are global actors and are gaining relative strength. Together with other regional powers (e.g. Turkey, South Africa, Indonesia) they are influencing global energy, climate, security, trade, and development policies. At the same time, however, they are too weak because they – despite partly strong economic growth – are unable to eradicate poverty in their own countries and an extremely imbalanced distribution of income and wealth prevails resulting in massive social problems. Their ability to effectively lead on a global level is limited as they do not yet provide enough global public goods (security, monetary arrangements, development aid). The seminar deals with changes in global order, the rise of the emerging powers, focusing on different concepts of US and EU developments, China’s rise, and the multipolar world order. You can find more information about Prof. Dr. Robert Kappel here. The Global Refugee Crisis: What is at Stake? The course will survey the most salient issues presented by the current refugee crisis, providing an overview of the global crisis, the crisis from the perspective of the refugees themselves, the impact of the crisis in Israel, Europe, and Germany, causes of the global surge in refugees today, a case study of conflict in Syria, and potential solutions to the crisis as a whole. The course will be taught by Prof. Beverley Crawford Ames (UC Berkeley), teaching assistant Katharina Konarek (University of Haifa) and a number of special guest lecturers. You can find more information and a program here as wel as a short summary. Prominent academics and public figures, among others, Prof. Daniel Gutwein and Dr. Ami Vatury, Prof. Wolfgang Merkel, renowned scholar of democratic transitions, and Yossi Yonah, and Tamar Zandberg, Members of the Israeli Knesset, will be discussing current issues and the potential of a social-democratic future. On this highly controversial basis, the participants are invited to enter the discussion on the one hand about the recent success of right-wing populist movements, and on the other hand on the failure of the neoliberal status quo. The conference will also discuss the current foreign policy challenges and the state of global justice. See also an article about the conference on "FES connect" and a summarizing publication by Dr. Alfred Pfaller: "A road-map to a Good Society"
The conference was a unique gathering of the world’s best experts on the Persian Gulf region. Sessions dealt with internal, regional, and national issues concerning these countries. How will they weather the precipitous fall in oil prices? Can they successfully confront the Islamic State? Is Yemen Saudi Arabia’s Vietnam? It was significant that the conference has been held in Israel, when the threats from Iran, the fallout of the Arab Spring, and the rise of the Islamic State have created a confluence of interests between Israel and these states. Earlier this month, Prime Minister Netanyahu referred positively to aspects of the Saudi-sponsored Arab Peace Initiative, and therefore the conference also addressed the possibilities for jump starting the peace process based on a regional solution. With this exhibition at the University of Haifa, the Haifa Center for German and European Studies (HCGES) in cooperation with the Konrad-Adenauer-Stiftung Israel honored the legacy of the statesman Konrad Adenauer and his utmost importance on German national and on the international level. But most of all, it emphasized the first Federal Chancellor’s role for the development of the “wonder”-ful partnership between Germany and Israel today. The exhibition has been shown at the University of Haifa during the entire academic year 2015-2016 and was closed on the occasion of the visit and in the presence of the German Ambassador to Israel Dr. Clemens von Goetze. At the beginning of June 2016, the HCGES in cooperation with the Bucerius Institute and the Ruhr University of Bochum supported the international conference dealing with “A Player and not just a Payer?” The Work of German Political Foundations abroad with a special focus in Israel and the Palestinian Territories. This conference was held in Bochum (Germany) and conducted by our PhD student Katharina Konarek. It dealt with the questions: What role do the German political foundations play in the international arena? What impact do they have on the German foreign policy? Are they think tanks, independent political actors or an instrument of the foreign office? How do they influence the political landscape in the countries they are working in? How did and do they influence the development of German-Israeli relations? Israeli, German and Palestinian academics and experts from the field discussed these questions intensely. The main contributions will be published in a conference volume. Karl Kraus im Urteil literarischer und publizistischer Kritik" by Dietmar Goltschnigg is a scholarly publication that documents the broad and diverse resonance of the eloquent satirist Kraus from the beginning to the contemporary era. The lecture of Prof. Dietmar Goltschnigg in German language took place in Haifa and was a cooperation between the Haifa Center for German and European Studies, the Austrian Cultural Forum, the Bucerius Institute, the Central Committee for Jews from Austria in Israel and the Association of Israelis from Central European origin. In May 1916 the governments of Britain and France signed a confidential agreement about the division of territories in the Middle East under the direct rule or the political influence of these states, following the anticipated collapse of the crumbling Ottoman Empire. Known as the Sykes-Picot agreement, it was named after its signatories Thomas Sykes of the British foreign ministry and Charles-Francoise Picot of the French foreign ministry. This agreement divided large territories in the Middle East between the then Empires of France and Britain and played a crucial role in designing the boundaries and political dynamics in and between states in the modern Middle East. The Sykes-Picot agreement, creating the foundations of the modern Middle Eastern state system represents the pinnacle of European Imperialist designs for the Middle East and continues to shape the politics and conflicts in the region. Despite its numerous flaws and the many challenges it confronted, this state system persisted for quite a long period. Yet, in the last few years, this system seems to be on the verge of collapse, while raising numerous questions about the future of the Middle East. Accordingly, the conference at the University of Haifa focused on addressing three major puzzles. The first one addressed the birth of the regional system (in the Sykes-Picot accord as well as in the various peace agreements following WWI). The second puzzle focused on the factors, which have led to the endurance of the Sykes-Picot arrangement for almost a century. The third puzzle addressed the current challenges to the regional system and their potential effects on the persistence or the transformation of the Sykes-Picot system. The conference was concluded with a debate on whether the Sykes-Picot boundaries and state-system are likely to endure or to go through major transformations. In this context various scenarios regarding potential solutions to the Israeli-Palestinian conflict were discussed. The conference also addressed the relations between the current changes in the Middle East and the changing of international order, notably the relations between the region and Europe (including issues of immigration, refugees and terrorism). Workshop: "New Gatekeeper in a Globalized World? The Israel Transparency Bill"
Minister of Justice Ayelet Shaked of the Jewish Home Party scored a personal and electoral victory when she released what she calls the "Transparency Law," a proposed piece of legislation intended to require Israeli nongovernmental organizations to reveal to the public whether they receive financial support from foreign states. It was hardly by chance that Shaked chose to include the word “transparency” when coming up with a name for her new law. Borrowed from the social protest movement, the term has the positive connotation of orderly government among the public. The workshop aimed at discussing different aspects and viewpoints regarding legal and political aspects of international organization supporting Israeli NGOs. The scholarship holders attended the workshop “New Gatekeeper in a Globalized World? The Israeli Transparency Bill”, and had a campus tour to receive a global overview about the academic life at the University of Haifa. Katharina Konarek (HCGES) held an information session and informed about study possibilities, internships and the HCGES activities. Besides, the students met with Rakefet Rosental and scholarship holders of the Jewish-Arab-Center. The visit ended with a small briefing about the economic relations between Israel, Germany and the Palestinian Territories. Dr. Herbert Lappe: "The Holocaust Remembrance in East Germany"
The memory of the holocaust in the GDR had been inconsistent: On one hand it was well known, on the other hand people knew nearly nothing about Jews, their history in Germany and the background of antisemitism. Furthermore, most Germans were victimized in terms of the Nazi regime. First the lecture showed the visible dealing with the holocaust and the less obvious gaps. Afterwards, these phenomena were explained, considering the “anti-fascist state” and its dictatorship. At the end the lecture presented activities of remembering the holocaust that were not connected of the Communist Party and the government. The annual workshop of young researchers in the field of German history and culture has taken place at the HCGES this year. This annual workshop offers young Israeli M.A. or PhD students the opportunity to present their research to a small academic community and to receive feedback on their work. The HCGES is conducting the workshop together with six other institutions: the Bucerius Institute (University of Haifa), the Center for German Studies (The Hebrew University of Jerusalem), the Leo Beck Institute (Jerusalem, the Minerva Institute, the Koebner Center and the Franz Rosenzweig Center (all: The Hebrew University of Jerusalem). The movie “Fire Lines” is a documentary telling about how several countries operated together to fight back the wildland fire in the Haifa Carmel Mountain in 2010. Also the Palestinian Authority sent firefighters from Jenin and Bethlehem and worked side by side with the Israelis. This can be seen as an example that is comparable to the basic idea of the European Union. The film screening was followed by a vivid discussion. The event took place in cooperation with the Dean of students. Jan Wilkens (student at the University of Haifa, scholarship holder at the Friedrich-Ebert-foundation and intern at the HCGES) conducted a seminar about the education system in Israel together with other scholarship holders from various German political foundations. The seminar served the purpose of uniting German students from different backgrounds in order to learn more about how the state of Israel deals with education and to discuss how the promotion of peace is included in the education system. The seminar was divided in two parts: firstly, the students prepared presentations and group work to be informed about the education in Israel. Then, several guest speakers from different educational organizations were invited to talk about their work and to discuss questions with the students. The event was supported by the HCGES. The HCGES together with the Minerva Center for the Rule of Law under Extreme Conditions organized a workshop along with a public discussion about the current situation of Syrians seeking refuge in Europe. According to UNHCR data some ten million Syrians have fled their homes during the past four years of a raging civil war. Nearly four million are refugees, having crossed international borders, while over six million are internally displaced (IDPs), seeking refuge inside the country. The majority of Syrian refugees remains in neighboring countries – Turkey, Lebanon and Jordan. In Europe, Germany has received the largest number of Syrian refugees and asylum seekers, currently estimated at 150,000. The dramatic pictures of refugees and migrants from Syria and elsewhere – crossing the Mediterranean clandestinely by boats and land-borders on foot – have certainly caught the media’s attention. The purpose of the workshop was to look beyond the pictures to the causes and consequences of these events, focusing on Syrian refugees in Germany. The Syrian civil war is a pivotal event for the politics and future of the region and of the relationship between Europe and Middle East. Thus the story of the Syrian refugees in Germany raises a number of important questions which were addressed in the tripartite workshop. In order to discuss the topic from different perspectives, speakers from academic, media, politics and civil society were invited. Firstly, Dr. Clemens von Goetze, the German Ambassador to Israel, conducted the opening of the event which was followed by the first panel: Dr. Helle Malmvig (Senior researcher, Danish Institute for International Studies) and Elias Perabo (Political Scientist, Adopt a Revolution, Germany) both gave a great introduction to the historical background speaking about the causes and developments in the Syrian Civil War. Next, Prof. Hans-Georg Soeffner (Permanent Fellow Institute for Advanced Study in the Humanities, Essen) held a lecture about the concept of a “central culture” for a decentralized society followed by talks about the law aspect in the refugee situation. Finally, the last panel discussed long term perspectives on the crisis. Stefan Bienefeld (Head of Division, Development and Transregional Programs at the DAAD) gave a brief overview of the DAADs support for refugees from Syria in Germany and about regional cooperation. Afterwards Prof. Yossi Yona, Member of the Knesset discussed together with Maria Jammal from the NGO Humanity Crew and Dr. Bernadetta Berti about the contribution of the neighboring states to ease the humanitarian crisis in Syria. With up to 100 participants the workshop was very well attended. 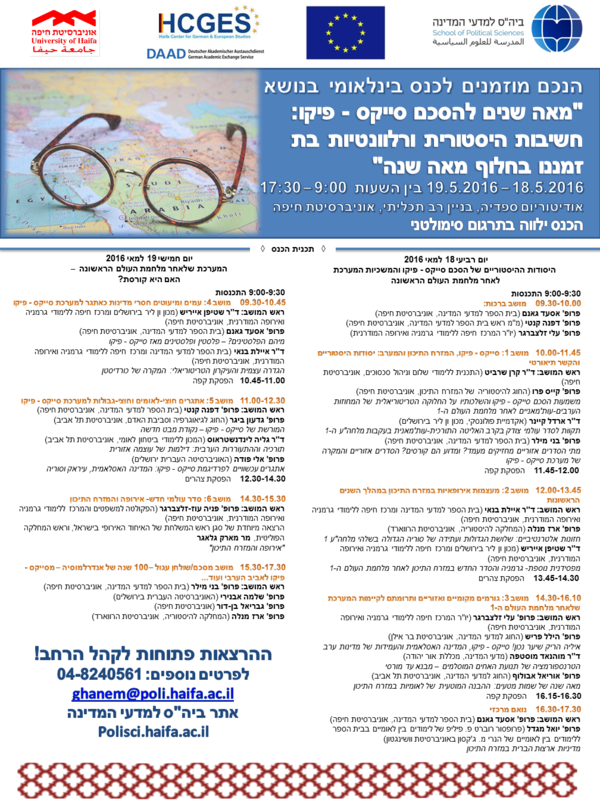 From 13 December 2015 until 19 December 2015, the Haifa Center for German and European Studies (HCGES), together with the DAAD Center for German Studies (CGS) at the Hebrew University of Jerusalem conducted a research workshop for 12 junior researchers studying Contemporary Germany and Europe at the DAAD center. During the workshop the DAAD, who generously supported the event, was represented by Stephanie Knobloch, in charge for Project Funding for German Language, Alumni Projects, Research Mobility at the DAAD headquarter in Bonn. After a short introductory session of the workshop topic "German and European Studies as Area Studies - An Academic Discipline" the young researchers from Germany, the USA, China, the Netherlands, Poland and Israel joint firstly the three days international conference "The Relevance of Regions and Area Studies in a Globalized World" at the Hebrew University of Jerusalem. Together with leading international academics, e.g. Prof. Thomas Risse (FU Berlin) and Prof. Frank Schimmelfennig (University of Zurich) the participants discussed the concept of "area" and "region". The second part of the workshop was conducted at the University of Haifa. During an opening session Prof. Ton Nijhuis (DAAD Center Amsterdam) reflected together with academics like Prof. Benny Miller (Political Science, University of Haifa) and Prof. Gur Alroey (Israel Studies, Head of the School of History, University of Haifa) the different concepts of area and regional studies. Afterwards, each participant presented his research paper commented by Prof. Fania Oz-Salzberger (HCGES), Prof. Susanne Zepp (FU Berlin), Dr. Ayelet Banai (HCGES), Prof. Noam Shoval (CGS), Prof. Ton Nijhuis (DAAD Center Amsterdam) and Prof. Anton Pelinka (University of Budapest). Furthermore, they discussed its focus on an interdisciplinary dialogue across the Humanities and the Social Sciences, also on the different research agendas and substantive analysis reflected by different geographical viewpoints. The program was completed by a session on research method conducted by the German Historian Dr. Stefan Ihrig (Van Leer Jerusalem Institute) and the Italian Geographer Prof. Stefano de Cantis (University of Palermo), a lecture on the concept of the Mediterranean region hold by Prof. Yossi Ben Artzi (Faculty of Humanities, University of Haifa) and a field trip to Haifa and the northern region of Israel. The HCGES was a partner in convening an international conference, which took place in Jerusalem. Active participants from the HCGES included Prof. Eli Salzberger, Dr. Ayelet Banai, Katharina Konarek and the M.A. Students of the Center together with the participants of the DAAD graduate workshop, which took place in Haifa subsequently. The delegation met with the MA students of the HCGES at the University of Haifa. The main aim was to talk about the student's motivations to study German and European Studies at the HCGES and their feelings towards the German language and German culture. The Visit was part of the study trip "Deutsch-Israelische Gedenk- und Jubiläumstage 2015". After a short introduction round and a few greeting words from the director of the Center, Prof. Eli Salzberger, the students presented their personal motivation and talked freely (partly in German and in English) about their attitudes towards Germany. Some students also shared their personal family history connected to the German history and explained how their family members see Germany nowadays. The holocaust and the connection between the German and the Jewish/Israeli history was also something the group talked about. They also managed to look into the future and share opinions about the upcoming challenges in Europe and how the students perceive those. The discussion following showed different views, but also promoted a better understanding. After having had a campus tour to receive a global overview about academic life at the University of Haifa, Katharina Konarek (HCGES) hold an information session and informed the young students about study possibilities, internships and the HCGES activities. The visit at the University of Haifa was part of the information trip of 20 Jusos from South Hesse, who want to widen their understanding of the life of young Israelis and Palestinians and their connection to Germany. In his lecture, Minister Tiefensee reflected on the effects rapidly developing and expanding communication possibilities have on our society. Never before, has the exchange of information been as easy and immediate as it is today. That development poses questions concerning our cultural identities and what role, if any, they still play in a digital and in a world without borders. The lecture was followed by a discussion with the participating students, researchers and the public. Prof. Niva Elkin-Koren from the Faculty of Law at the University of Haifa moderated the event. The HCGES organized a meeting of the Juso Bundesvorstand – among them Johanna Uekermann, Head of the Jusos - with Prof. Assi Ben Artzi , the former rector of the University of Haifa, members of the Arab-Jewish-Center, HCGES students, Katharina Konarek (PhD student at the HCGES) and two representatives of the Student Union , Gal Marom (Young Likud) and Daniel Amital. In this way, the young leaders of the German SPD had the chance to ask questions concerning how the students perceive the situation at the university and how the Student Union is involved in supporting the co-existence. In the framework of the 50th Anniversary of German-Israeli Diplomati c Relations, the HCGES together with the Konrad Adenauer Foundation in Israel hosted an exhibition on Konrad Adenauer, the first chancellor of the Federal Republic of Germany, and his relations with Israel. This special event marked the opening of the academic year 2015-2016 at the HCGES. In the first part, the exhibition on "Konrad Adenauer" was festively opened by Gabriele Hermani, Science Counselor of the German Embassy in Tel Aviv, Prof. Eli Salzberger, Director of the HCGES and Michael Borchard, Resident Representative, KAS. In the second part, a panel on "Continuing Adenauer's Legacy took place: The Future of German-Israeli Science Co-Operation" took place with: Dr. Michael Borchard, Resident Representative, Konrad-Adenauer-Stiftung Israel, MP Dr. Claudia Lücking-Michel, Member of German Bundestag, Committee on Education, Research and Technology Assessment, German-Israeli Parliamentary Group, Prof. Ute Deichmann, Jacques Loeb Center for the History and Philosophy of the Life Sciences, Ben-Gurion University of the Negev and Ilana Lowi, Director, Division of International Relations, Israeli Ministry of Science, Technology. The exhibition was presented at the University of Haifa until the end of the academic year 2015-2016.